Today is Valentine’s Day! A romantic party very popular in Taiwan. How do you usually celebrate it? Do you have romantic plans with your special one? 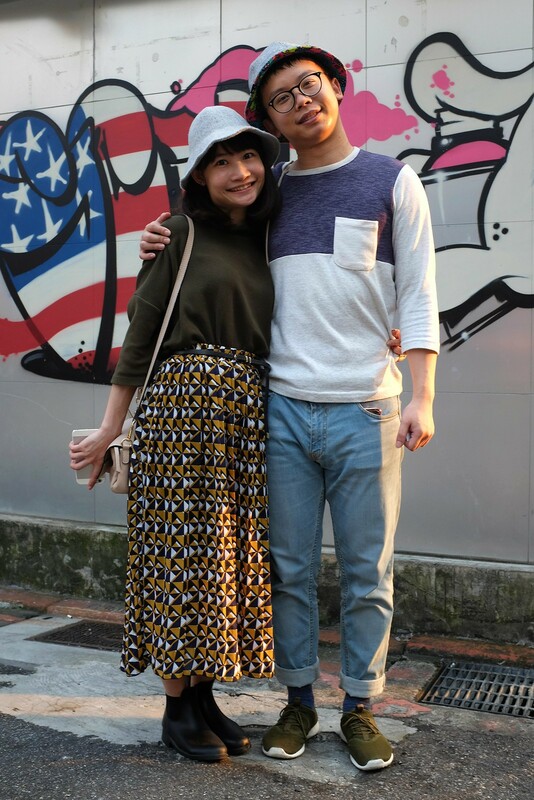 In today’s spirit, I want to share with you a few stylish couples that I have spotted in Taipei. It’s quite common to see some couples dressing similar clothes, or wearing matching T-shirts (with messages like “I’m his” and “I’m hers” pointing to the left or to the right). The couples I’m featuring here today are wearing different clothes but somehow their styles are in tune. The first stylish couple are Amber and Mace. They were at the Songshan Cultural Park when I met them. As you see, both are wearing sunglasses, shirts, skirt/trousers by the knee, and their socks are well visible. Also, both are carrying backpacks. 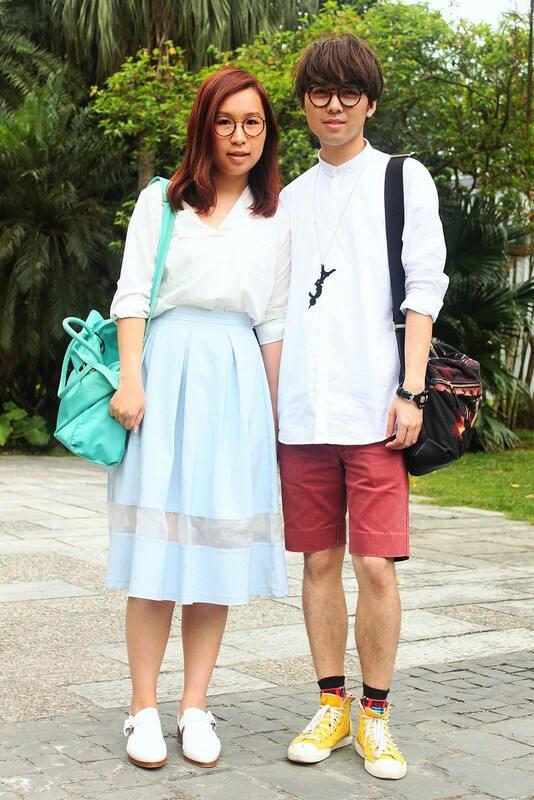 The second stylish couple are Vicky and Erick. They were at the Zhongxiao Dunhua area when I met them. As you can appreciate, they are both wearing grey hats, each one different but similar. Their sweaters both have three-quarter length sleeves, and they wear long skirt/jeans. The third stylish couple are Crystal and Stephen. Although they are from Hong Kong, I met them when they were also at the Songshan Cultural Park during their visit to Taipei. As you can see, they are both wearing round tortoiseshell-rimmed glasses, white shirts, and skirt/trousers by the knee. Their bags also have similar styles. What do you think of this trend? Do you also wear similar clothes or matching outfits when you are with your special one? In Spain you can find many stylish couples, wearing similar clothes or styles. But I think I’ve never seen a couple wearing exactly the same clothes or matching T-shirts (with messages like “I like him” and “I like her” pointing to the left or to the right). What about in your country?